With the Canucks leading us into what could be the most thrilling Spring in recent Vancouver's history, Canucks Outsider will be "Alive for the Playoffs" with a live video companion webcast on Friday or Saturday Canucks games throughout the run towards Lord Stanley's Cup. Join in the fun with live chat, trivia, memorabilia, hi-jinks, beer, interviews and anecdotes. 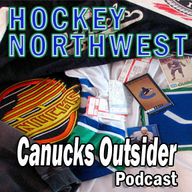 Canucks Outsider - the original Canucks podcast brings irreverent analysis and witty insight as Host Dave Thorvald offers updates and discourse on the National Hockey League's Vancouver Canucks from a fan's perspective. A long-time hockey aficionado and writer, Dave is often joined by the wise Dan Funboy or other outspoken guests. Shows are sometimes recorded in-game, sometimes at a local pub or on the porch after another win but always with a beer in hand. Canucks Outsider also offers some news about international tournaments, WHL Northwest franchises, other NHL teams and hockey culture in general. A special hello to Canucks fans far and wide in foreign lands.